Want to connect with Bobby? We are a full service Plumbing Contractor serving the Oklahoma City Metro and surrounding areas, from Edmond to Blanchard and Yukon to Choctaw. We specialize in new construction, service and repair, remodels, and additions. Our techs are skilled and knowledgeable in the Plumbing Trade. We take pride in a job well done, and top notch service and customer satisfaction. We are Licensed, Bonded, and Insured for you protection. Priority service for Property managers, Realtors, Rental Owners, and Businesses with an established Business Account with us. 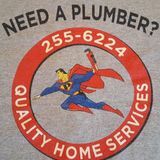 Let us prove that "We should be your Plumber". 24Hour Emergency Service!